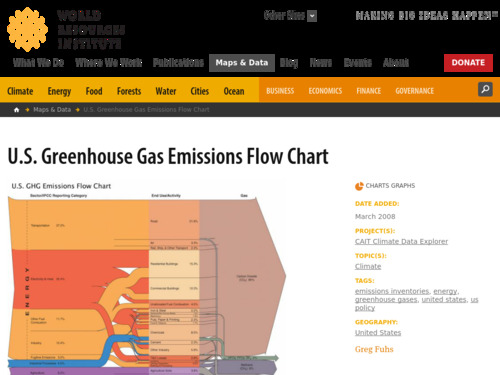 The image contains a lot of information and can be used as a supplement for many lessons on production of greenhouse gases by humans and human impacts on climate. The image shows all human contributions to greenhouse gas emissions. Energy use is by far responsible for the majority of greenhouse gases. Most activities produce greenhouse gases both directly, through on-site and transport use of fossil fuels, and indirectly from heat and electricity that comes "from the grid." All emissions data is from 2003. There is a lot going on with the arrows in this image, but students can follow the different colored arrows from the sector to end use to the produced greenhouse gas fairly easily. Students can compare this graphic to CO2 emissions in the year 2000. There are related resources supplied at the bottom of the webpage. A key is not provided for the different colors of Category/IPCC Reporting Sector, End Use/Activity, Gas, and terms are not defined, which may cause confusion for learners.